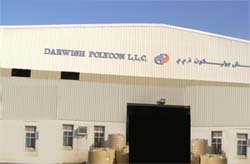 Darwish Polycon LLC has started manufacturing a comprehensive range of International Food Quality Water storage tanks from its most modern plant in Rusayl Industrial Area from April 2002. 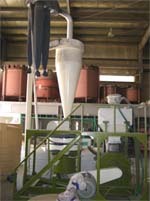 It takes it's legacy from Polycon Gulf Ltd, UAE- a pioneer of Polyethylene tanks industry in the Gulf Region since 1993. Polycon tanks are manufactured to strict quality guidelines to ensure years of high performance use. Moreover, we use raw materials that meets International Food Grade specifications to ensure safe storage of potable water. We are using the Linear Low Density Polyethylene (LLDPE) that has good mechanical properties, high stiffness, capable of being welded (repaired) . Excellent environmental stress crack resistance. The LLDPE used meets specifications contained in the International FDA and EU regulations for use in contact with food and potable water. Rotationally moulded products made without pressure, are relatively stress-free compared to products made with high pressure processes. Therefore they are tough and long lasting . Stabilized against ultraviolet rays of the Sun and therefore can be used indoors as well as outdoors. Seamless products- one piece, no joints and hence leak proof. Corrosion resistant (rust free) and maintenance free. Have excellent load bearing qualities. Hygienic and eminently suitable for storage of potable water. We ensure a consistently high standard in our rotationally moulded products by stringent quality control procedures both in the selection of raw materials and every stage of production. Our tanks carry warranty for a period of five years against any manufacturing defects. In case of any manufacturing defect our liability is restricted to replacement of the tank only. Five year warranty voided if placement and plumbing are faulty (tank details of stands & placements of tanks and important points for plumbing is enclosed with the D/O for information).